Horsepower without restrictions... Price within reach! The Active Autowerke Rear exhaust for the E46 M3 has been one of the most popular sellers for us at VAC for almost a decade. Active never stops improving their system for the E46 M3; one that sounds, looks, and works great all at a very reasonable price! Improves power output on N/A or supercharged E46 M3s. 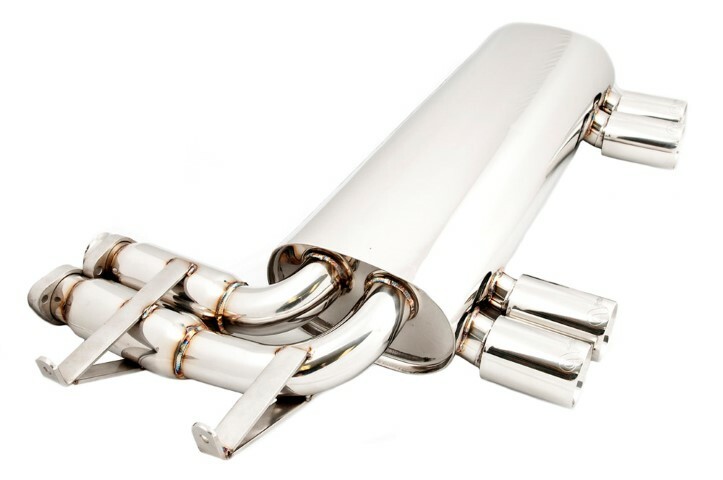 Designed specifically for the BMW E46 M3, the all-stainless Active Autowerke Generation 6 is our most innovative cat-back exhaust to date. Its precision-tuned straight-through design with in line resonators offers an incomparable combination of power, sound and styling. Well suited to both naturally aspirated and supercharged vehicles, this new and revolutionary design employs inspired pipe routing and optimum diameters to enable the Gen 6 to literally unleash horsepower without restrictions. Everything else about our Signature Exhaust is new. It’s lighter, stronger and more robust – with a distinct sound unique to the generation. Does it work? You bet it does. Performance gains of 5-7 peak rear WHP can be expected. Is it really that free-flowing? Comparison dyno tests were run on an E46 M3 with no rear exhaust vs one with the Gen 4 system installed, then Gen 5 and 6... Zero power loss was measured with the Gen 6 in place. Like we said, this thing is practically invisible! But you can sure hear it. Just listen for the rich, low frequency tone at idle to moderate RPMs. And the distinct, robust sound at higher RPMs. With its flush aerodynamic fit, high-polish finish and quad 80mm straight tips, this rig is considered by many enthusiasts to be the sleekest, most aggressive exhaust around. Sporting a newer, more rounded look; an aerodynamic fit; high-polish finish and quad 80mm straight tips, this rig is considered by many enthusiasts to be the sleekest, most aggressive exhaust around. Installation is simple, utilizing all the stock mount points with no rear valance mod required.